If your garage is due for an upgrade, look no further than Custom Garage Works! In 2003, we began providing high quality garage floor coating in Flower Mound, TX after we needed more out of our own garages. While we were unable to find the services we wanted within the industry, we did not let that stop us, but instead, we decided to join the industry ourselves. Now, we proudly offer professional garage storage solutions, along with top-of-the-line polyurea polyaspartic floor coatings, that have a significantly longer lifespan than epoxy. Our team of professionals is committed to providing DFW with premium garage solutions and garage floor coating. 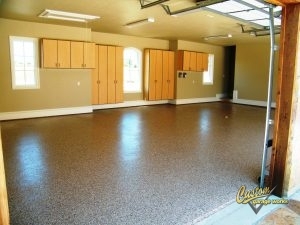 One of our most common garage options is our garage floor coating in Flower Mound, TX. This boom in popularity is likely because our coatings are more durable than epoxy, and cure faster, which means that you can use your garage within 24 hours in most scenarios. Thanks to it’s tough composition, our polyurea-based floor coating is resistant to yellowing and flaking that can occur with epoxy. Since we choose to use a diamond grinder to prepare the floor for coating, as opposed to acid etching, we can provide a higher quality end result. If you are interested in learning more about our garage floor coating service, please schedule your free estimate when you call 214-494-9068 or 817-308-1305. Polyurea Polyaspartic Coatings These coatings are particularly resilient, as well as resistant to heat and UV rays. And More! 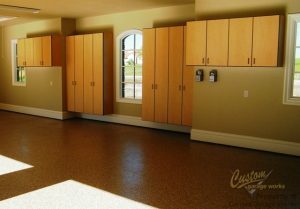 Learn more about our variety of custom floor coatings, and determine which one will work best for you! As for storage, you’ll never have to wade through piles of clutter in your garage again when you choose a storage solution from Custom Garage Works. Your garage looks best when it is tidy and organized. With products such as garage cabinets and overhead storage racks, we have a variety of options for our clients’ garage organization requirements. Designed specifically for garage use, our garage cabinets are among the best in the business, and our storage racks are designed for high capacity storing. For a reliable garage floor coating in Flower Mound, TX that will last for years, and an organization solution that cannot be beat, you can rely on Custom Garage Works! Overhead Storage Racks If you want to get more from your overhead storage space, our overhead racks provide resilient and dependable storage. Storage Cabinets Unlike kitchen cabinets, these are made specifically to let you get the most from your garage space! Car Lifts If you ever wanted your garage to be a showroom, our garage auto lifts are a good place to begin. And More! Do not be concerned by clutter in your garage any longer. We have the organization products you need!